Have you had Mexican Grilled Corn or Elote yet? In my personal experience (we’ve had it twice this week), you don’t have to have it more than once to become completely and hopelessly addicted. 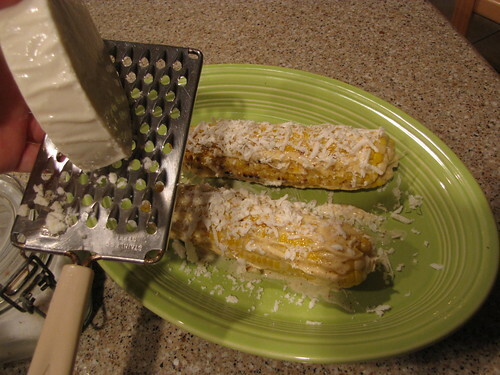 It’s corn on the cob, grilled in the husks, and slathered, yes SLATHERED in creamy, cheesy goodness. And the answer is…BECAUSE YOU CAN! 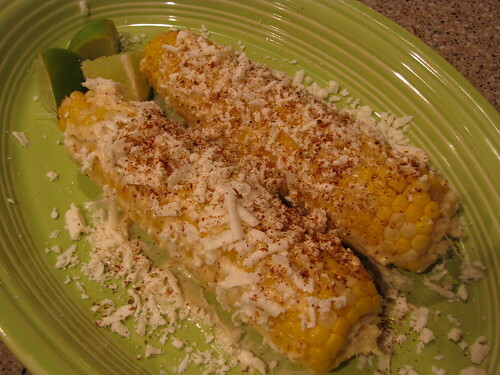 Corn on the Cob in the husks, Mayonnaise, Queso Fresco or other crumbly cheese, Chili Powder, and Lime. I peeled back the very top of the corn and pulled out that big clump of stringy silks. Don’t peel it back too far, you want the husks fairly tight so they keep the steam in to cook the corn. 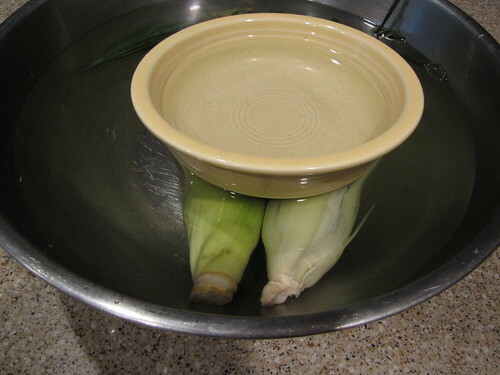 Place the corn in a big bowl of water and weigh it down with a smaller bowl so it doesn’t float. Soak the corn for 10 minutes. 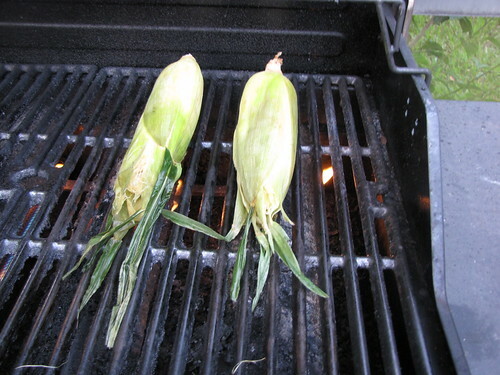 You must soak the corn so it steams and doesn’t burn up on the grill. 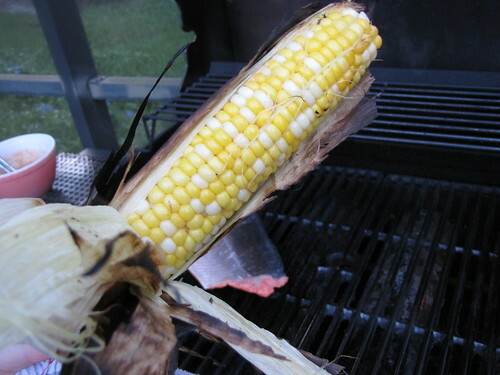 Place the corn over a medium flame on the grill. 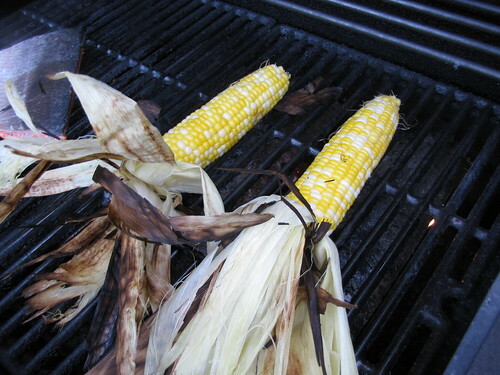 You want it hot enough to cook and blacken the outside but not so hot that the flames actively touch the corn. Close the lid to keep in the heat. Come back a few minutes later and turn the corn over to cook the other side. You want to repeat this process until the corn husks are browned on all sides. Depending on the heat of your grill, this takes between 8-10 minutes. Your patio now smells AWESOME! Like the state fair without the cow poo! Use a towel or oven mitt to grab the corn at the base and pull the husks back with a pair of tongs. 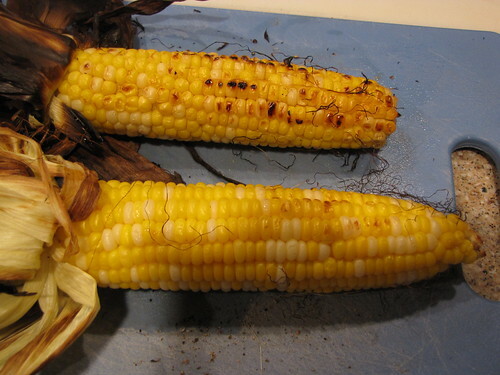 Place the corn back on the grill for 1-2 minutes per side to get a little extra char on the kernels. 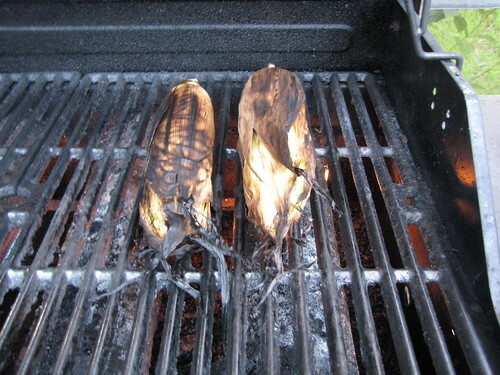 When you have some nice little charred spots, rescue the corn from the grill. Use your fingers to pick off any remaining little silk threads. They get charred so they’re easy to remove. You could serve this with the bottom husks on, and I would if I were eating outside. But inside they make a huge mess so I broke them off and used those little plastic corn pickers. You’ll need about 1 Tablespoon of Mayonnaise per ear of corn. 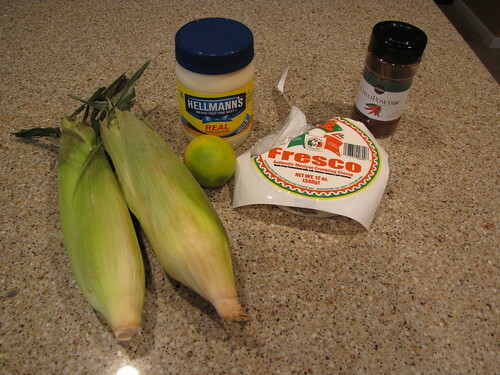 Mix that with about 1 teaspoon (or more to taste) of chili powder then slather it all over the hot corn. Grab some crumbly Mexican cheese like Queso Fresco or Cotija and grate it over the mayonnaise layer. 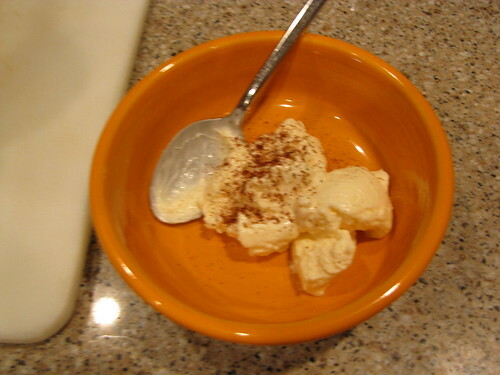 Sprinkle the top with a little more chili powder and serve with lime wedges for a little extra zing. You will get it all over your face so just give up on trying to be dainty and dig in! Okay, maybe it’s not the most healthful way to prepare a vegetable, but it sure is tasty! Over and over and over again! That looks ridiculously good. I have got to try this one! I would marry corn grilled in the husk.